Iran could launch a pre-emptive strike if Israel prepares to attack it, a senior Revolutionary Guards commander told broadcaster Al-Alam on Sunday, a day after his boss warned that conflict was inevitable, the AFP news agency reports. Should Israel and Iran engage militarily, "nothing is predictable... and it will turn into World War III," Brigadier General Amir Ali Hajizadeh told Iran's Arabic-language television network. Hajizadeh, who is in charge of Revolutionary Guards missile systems, said: "In circumstances in which they (the Israelis) have prepared everything for an attack, it is possible that we will make a pre-emptive attack. But we do not see this at the moment." He added that Iran would deem any Israeli strike to be conducted with US authorization, so "whether the Zionist regime attacks with or without US knowledge, then we will definitely attack US bases in Bahrain, Qatar and Afghanistan." He warned that Israel "cannot imagine our response -- and it will sustain heavy damage and that will be a prelude to its obliteration." On Saturday, the head of the Revolutionary Guards, General Mohammad Ali Jafari, said war between Iran and Israel "will eventually happen, but it is not certain where and when." 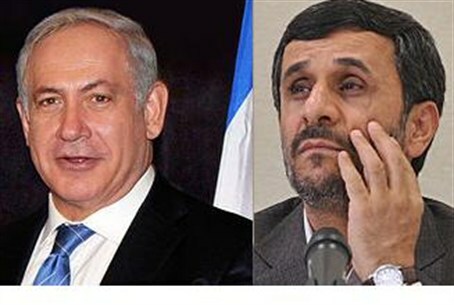 Jafari, quoted by the ISNA and Fars news agencies, also said such a conflict would lead to the annihilation of Israel. "If they begin (aggression), it will spell their destruction and will be the end of the story," he said. On Sunday, Jafari's deputy, Brigadier General Hossein Salami, told Fars in an interview that Iran's "defensive strategy is based on the assumption that we will engage in a war, a massive battle against a global coalition led by the US." He said the Islamic republic had made preparations to "crush" the enemy by hitting "enemy bases in the region, the security of the Zionist regime (Israel) and the energy market, as well as the lives of enemy forces." He added: "We will not start a war. But if someone wages war against us, we will launch continuous offensives." Tensions have risen significantly in recent weeks, with Israel threatening to unleash air strikes on Iranian nuclear facilities. Israel believes Iran's nuclear program to be aimed at developing an atomic weapons capability that would menace its existence. Iran insists that its atomic program is exclusively for peaceful, civilian ends, but it is locked in a deepening stand-off with the UN nuclear watchdog and the UN Security Council over the issue.